A native of Olympia, Washington trombonist Caleb Lambert began his studies on euphonium in the 5th grade and later took up trombone in the 6th grade on the advice of his band teacher. After moving to Chicago in 2007 Mr. Lambert earned both a bachelor’s degree in trombone performance and a master of music in orchestral studies from Roosevelt University where he studied with Jay Friedman and Peter Ellefson. 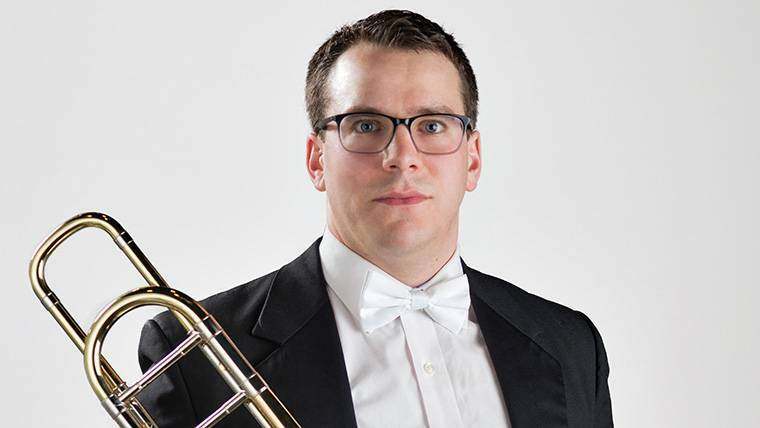 In addition to his duties as 2nd trombone for Orchestra Iowa, Mr. Lambert is also the principal trombone for the Chicago Composer’s Orchestra and the Chicago Chamber Orchestra. As an active performer he has worked with the Chicago Symphony, South Bend Symphony, the Civic Orchestra of Chicago, New Chicago Brass, and many others. Just as comfortable on valves as he is with his slide Mr. Lambert was the Grand Prize Winner of the Chicago Brass Festival’s Solo Competition on euphonium and can often be seen performing on euphonium and bass trumpet in the Chicago area. As an educator Mr. Lambert has taught classes in chamber music and trombone pedagogue at some of America’s leading music conservatories including the Juilliard School of Music, Manhattan School of Music, Boston University, New England Conservatory, University of the Pacific, Southern Oregon University, University of Las Vegas, Western Illinois University, California State University, Sacramento and many more. In 2013 he was the trombone faculty at the prestigious Boston University Tanglewood Institute. When I was in the 6th grade I worked out a deal with my teachers that I would start playing trombone in the 5th grade band in addition to playing euphonium in the 6th grade band. Not only did this prepare me to enter jazz band in 7th grade (my band teacher’s agenda) but it got me out of an extra forty five minutes of sitting in class with the other kids.